Species description: Largest Species of Entelodont and Largest Carnivore Pig of all time. It was a relative of the ungulates and a cow- sized predator with large canines. They ate camels , oreodonts , brontotheres ,and horses on the Oligocene fields. It could also dig for roots and tubers. It had an elongated skull with long bony knobs beneath the eyes and on the lower jaws. It also had long spines on its thoracic vertebrae over the shoulders and a small brain, and often obtained lengths over 8 ‘. Its jaw could snap shut quickly and kill any animal during its time and was highly successful. It hunted in packs and could run off a huge hyaenodon. One unnamed species lived during early Miocene .The early archs were a little smaller than later Oligocene archaeotheriums . Item rating and description :1-10 9.2 MONSTER ADULT 23” LONG Entelodont” Terrible Pig “Archaeotherium 11” Wide Unique Skull found last year on a South Dakota private ranch . What a beautiful monster specimen with some restore. I estimate this is over 80% original with teeth even better at only the incisors in the front restored. This found in late Oligocene soils. This is one of the better ones I’ve had , as anything over 75% now is very very good . The size, teeth and skull make this a adult at the time of the biggest entelodonts . The back of skull has some restore, zygos, and part of ears with spot fills here and there. Some repair occurred also. The ears are displayed down which is why it would be 16 inches wide otherwisw. They were smart, resourceful , team killers on the West Plains of North America .This is the most sought after mammal now after all the BBC Prehistoric Beast immortalized publication tape. IT shared the Oligocene Period with hyaenodons as the top predators but these were in teams and were top dogs so to speak . The originality is very very good with super teeth . It’s very easy to see restored areas on this colorful pig but few have one this size .The colors are typical S Dakota with a yellow beige tint, and as time went these pigs evolved into daedons and large Miocene Archaeotherium also ,which I also have one. This is an huge adult. These animals made mince meat of the saber cats of the time. The values on these have skyrocketed due to rarity but you can have you pick with me. This was the top of the food chain. IT looks like a male to me but not sure as females got big also late in Oligocene. This is beautifully displayed on top display wooden mat with steel supports . Item rating and description: (1-10) *8.5* Rarest of Archaeotherium - Juvenile Nature’s Finest Entelodont Archaeotherium “Terrible Pig” Skull found last year in South Dakota. These small juveniles are hardly ever found and the person who knows the most over a 25 year career hunting these has only seen 3 other juveniles ever. What a nice specimen at 16” long, which is not large but large if you consider it was only a 8-9 year old carnivore. This is the most sought after mammal now after all the BBC Prehistoric Beast immortalized publication tape, which comes with this beautiful creature. This is probably a female as it showed sexual dimorphism and cheeks of females and young were smaller in size. This was the most feared creature of the Oligocene Period with hyaenodons. It has all original teeth and lower jaws and it even shows new tusks coming in behind the baby tusks which are worn but still present. All the teeth are to this pig so combined with quality of bone makes this pig great!!! One zygomatic arch is original and the other restored with 98% original behind the ears on the top of this carnivore baby also with one cheek flap original and some of the top before the nose restored and sides all top quality bone. Any restoration you can’t see so it is spectacular. The beautiful color of skull with black and brown spots is so appealing also as are the teeth color being all visible and shiny as to protect them. Most are in matrix due to strong possibility of breakage in prepping and this was safest for this specimen. The morphology is simply amazing for this animal. I saw one a little better quality and same size in Denver last year and it sold no questions asked for $16,000. These animals made mince meat of the saber cats of the time. This is your chance to get a quality beautiful specimen for less money than you will ever find for same quality!!!! 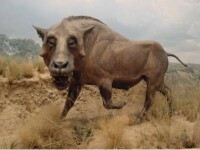 Species of Entelodont: It was a relative of the ungulates and was a predator with large canines. They ate camels, sloths, oreodonts, brontotheres, and horses on the Oligocene. It could also dig for roots and tubers. It had an elongated skull with long bony knobs beneath the eyes and on the lower jaws. It also had long spines on its thoracic vertebrae over the shoulders and a small brain, and often obtained lengths over 7’ long. It was 5-6 ft tall at shoulder. Its jaw could snap shut quickly and kill any animal during its time and was highly successful. It hunted in packs and could run off a huge hyaenodon. It also was a 1000 km mass. This species is so rare few exist anywhere. It could open its jaws very wide and snap down on prey. 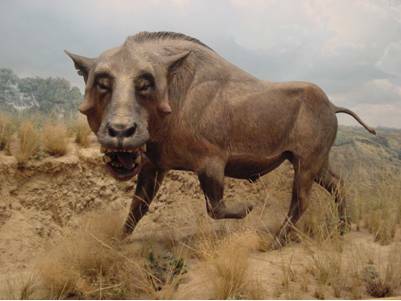 Species description: Largest Species of Entelodont and Largest Carivore Pig of all time. It was a relative of theungulates and a cow- sized predator with large canines. They ate camels , oreodonts , brontotheres ,and horses on the Oligocene fields. It could also dig for roots and tubers. It had an elongated skull with long bony knobs beneath the eyes and on the lower jaws. It also had long spines on its thoracic vertebrae over the shoulders and a small brain,and often obtained lengths over 6 ‘. Its jaw could snap shut quickly and kill any animal during its time and was highly successful. It hunted in packs and could run off a huge hyaenodon. Item rating and description:1-10 9.9 – Rarest of Rare Top Best Quality” Early Terrible PIG “ Archaeotherium 19” long by 15” wide. What is amazing this pig was early so it’s rare and smaller than later ones but it’s a old adult with some wear on teeth .This is the famous pig(entelodont) so highly publized in BBC Walking with Prehistoric Beasts. This is simply amazing quality with hardly any restore. One premolar on top and one on bottom with one incisor on teeth restored and a few spot fills is about it. A little on back of one lower and a little in back with ears perfect. The quality is the best I have ever seen(except on Lee piece years ago) and is virtually uncomparable to any . IT is a complete skull .This is for only top collectors who want an item you can’t get anywhere on quality. Quality means I paid a lot for this, so if you wish quality you have to pay . I’ve seen some not near as good go for $16,000 The canines are 2.25 inches long and all canines teeth original.This specimen may the best in the world so stop your drooling. This is one of my top five treasures. The early ones are hardly ever found. Size is not important on this because it’s early carnivore as it’s still at top of food chain, but quality is amazing. Just look at this bone. Also the display is simply amazing as it turns around to see all sides, which is an added huge advantage to display this prehistoric carnivore (Yes pigs were carnivores). This was marked well over this at Tucson show. What a treat for a discerning client . Just look at these pictures . You can click on pictures for closeups.